Mungiki re-emerge in Murang’a where they extorting money from sand harvesters, matatu operators, boda boda riders, prompting security teams to call for a crisis meeting – Kenyatta University TV (KUTV). All Rights Reserved. Residents of Murang’a County are now living in fear after re-emergence of illegal gangs that are extorting money from business people and boda boda operators as well as initiating the newly circumcised boys into the groups. The worst hit areas are Gitugi of Mathioya constituency and Kabati in Kandara constituency, prompting the security team led by Murang’a County Commissioner Mr. John Elung’ata to call for a crisis meeting at Kabati, giving the gangs a stern warning if they don’t quit extorting money from business people. 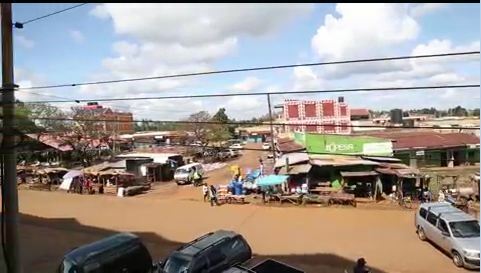 A sneak preview of Kabati town from a distance shows that all is well with traders and boda boda operators going on with their businesses as usual but the situation changes once you engage one on one with the residents. The residents reveal to us that most young men in the area have been recruited to join illegal gangs namely; Mungiki, Usiku Sacco, Gazza and the 42 brothers that have become a thorn in the fresh of the residents. The gangs have been engaging in theft, smuggling, initiating newly circumcised boys into their gangs and extorting money from business people especially sand harvesters and boda boda operators. Some of the residents like Jackson Njane have been left healing serious wounds caused by the gangs when they raided his home to steal only to chop off his finger while he tried to defend himself from their attacks. Sand harvesters I the area cried foul to the commissioner telling him that every time they ferry sand, the gang members bound their lorries by force at Kabati fly over where they demand a certain percentage of money from the sand that is being ferried. The boda boda operators have not been spared either and they say that they cannot refuse to give out money to these gangs for fear of being attacked. Most of the irate boda boda operators have called on the government to intervene and save Murang’a County from going back to where it was in 2007 where the illegal Mungiki sect members terrorized the County, killing its own people. Following a huge hue cry by residents and sand harvesters, Murang’a security team lead by County Commissioner convened a crisis meeting at Kabati where they listened to grievances from members of the public. The commissioner promised them that the extortions will stop immediately and gave a stern warning to the gangs that they will be force with even a bigger force than how they were eliminated in 2007. The parents were also asked to be on the lookout of who is advising their boys once they get circumcised, after area MCA Peter Mburu revealed that most of these gangs are recruiting the young men into their gangs immediately after circumcision. The commissioner said that he concurs with the MCA that parents need to be extra vigilant since the same boys are being forced to smoke bang.